Introduction: Readers love to read about overcoming adversity to achieve success. Open up about the trials you faced prior to your success. Introduce how changing your routine (big or small) positively impacted your ability to succeed and how it can help your readers too. List Routine Changes: Provide a list of routine changes that you made. In 2-3 sentences, describe how to best implement the change and the outcome of the change. Conclusion: Recap how the routine changes will positively affect your readers’ success. 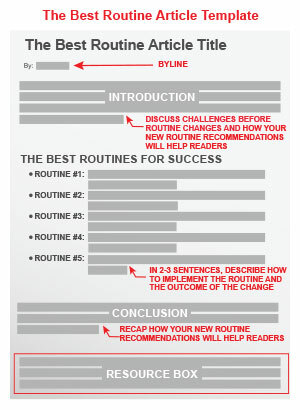 Have you written an article that discusses successful routines? Let us know how it worked for you by sharing your comments – we’d love to hear from you! Article Templates can help you easily organize your thoughts and ideas. Click here to get the dynamic 52 interactive Article Templates on PDF package. I appreciate this article because it gave me some clarity around how I might structure my content in the future to make a greater impact. I used the template on creating routines to produce an article. I found this template very easy to use and it spurred great ideas. Thank you. This article the effects of our daily routines on determining how we can succeed in business was an eye opener. Thanks. Yes, I shall make use of this idea for my artciles. This is a great template for those in the “bodybuilding” niche. But many other niches like dating, internet marketing, weight loss, or sports can use this too. I don’t really do product reviews but I could probably use this for “service” review.